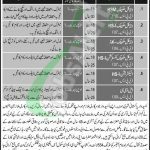 Here at this page, you’ll have Pakistan Army Jobs November 2017 at 554 Light Workshop Section EME. Jobs in 554 Workshop Section EME (School of Infantry and Tactics Quetta) are available and it is looking for highly educated, very experienced, hardworking and well disciplined civilian staff for the following positions such (Vehicle Mechanic HSM, Vehicle Mechanic HS-I, Vehicle Mechanic Skilled, Vehicle Mechanic Construction HS-I, Electrician HS-I, LDC). Above mentioned position will be recruit on Open Merit and Punjab Quota for which only eligible candidates should apply. The appointment will be done on a permanent basis and candidates willing to apply should have relevant qualification, diplomas, and experience mentioned in the following image such as for all positions Matric pass are eligible to apply and for Sr. No. 2 Middle pass candidates can apply. So, viewers take advantage of this opportunity because if you are just Matric pass and looking to have a job in any government department then it is the best opportunity for you to have it and here against these jobs you have to be confident because all positions will be recruit on merit basis. So, only suitable candidates should apply as per the following how to apply procedure given below. Candidates should attach with the application a paid bank draft of Rs. 200/- in favor of Commandant School of Infantry and Tactics Quetta. The last date for submission of application is November 25, 2017. Applications received after closing date or incomplete will not be entertained. Candidates from Government / Semi Government department should apply through proper channel. Only shortlisted candidates will be called for test/interview via calling notice. No TA/DA will be paid for test/interview. For more jobs please visit our site JobsAlert.pk. Last Date to Apply: November 25, 2017. Address: 554 light workshop section EME School of Infantry and Tactics Quetta Cantt.